NEW YORK CITY (WABC) -- The National September 11 Memorial is a tribute to the nearly 3,000 people killed in the terror attacks of September 11, 2001 at the World Trade Center site, near Shanksville, Pa., and at the Pentagon, as well as the six people killed in the World Trade Center bombing in February 1993. 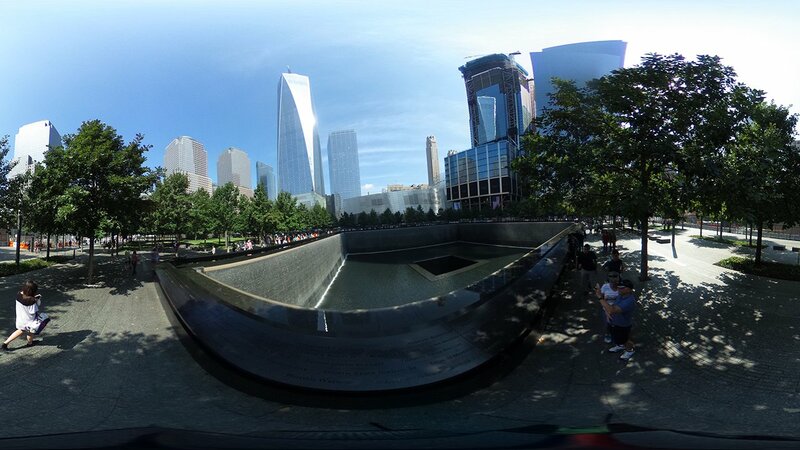 We invite you to visit the memorial in 360 in 5 different videos. To view 360, you must be watching on a Chrome or Firefox browser. If you are reading on our news app, please visit our YouTube page to watch these videos. The Memorial's twin reflecting pools are each nearly an acre in size and feature the largest manmade waterfalls in North America. They sit within the footprints where the Twin Towers once stood. Architect Michael Arad and landscape architect Peter Walker created the Memorial design selected from a global design competition that included more than 5,200 entries from 63 nations. The names of every person who died in the 2001 and 1993 attacks are inscribed into bronze panels edging the Memorial pools. You can learn more about the memorial by visiting the 911memorial.org website.